“Male Samurai Youth”; graphite on Arches paper; March, 2008 by Diana Mae Potts. 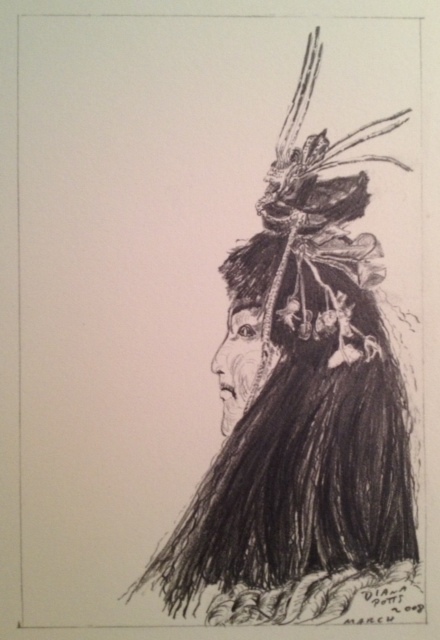 This is a graphite drawing of the head of a samurai doll I got on eBay several years ago. The former online copies of it were done on a scanner that scanned it very lightly. This is a better copy. An online copy was on my Barryville Are Arts Alliance website as the photo of my art for my profile there. It had an artist statement along with it. I saw this a few days ago. It has since disappeared. Several weeks ago I met someone in a local food market parking lot and told him about my art projects of drawing dolls some of which are Japanese. He asked me if I am “the samurai lady of Lackawaxen”. I thought this was an interesting question especially because he is a federal law enforcement agent. And no, I’m not being investigated or questioned. I’m thinking the local police simply browse through the local websites to get to know the people in the area. So, I guess I have this title which is funny. I only draw samurai and possess no other attributes. Now that I have figured out why anyone from law enforcement, in their humorous way of talking among themselves about individual people, brought up a fun nickname for me that my art inspired, it brings a twinkle to my eye. Right now, for some reason my profile that I put together has disappeared from the BAAA website. I’ll try to fix that in the coming days. By the way more Japanese related art is in the works now. For the time being, enjoy this one. And have a fun day!